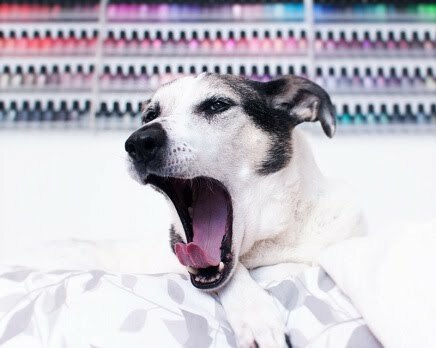 Polish Hound: Mail-time: Miscellaneous SUPER BLACK Polishes! I have an exciting mail-time today: SUPER BLACK Lacquers! I have been pining over SUPER BLACK's glitter mixes for over a year now, and just haven't gotten the chance to snag any until now. Hoorah! The boyfriend is actually a big fan of Natalie Dee, and mentioned he might get me some SBL for my last birthday, but nope! Boo! Anyway, this mail-time is actually from last month, and will probably be the last one for a while, since I'm on another no-buy through the Holidays. Enjoy! Ham's like, "you have box, I have carrot?" Everything was packaged really well, as you can see. The little polish bundles had absolutely no wiggle room. I was actually a little concerned because I'd read a lot of reports of The Haymaker shattering in transit. SUPER BLACK's customer service is awesome, and I know she always offered prompt replacements to everyone that that happened to. Still, I was pretty anxious! Luckily, everything was just fine, as you can see! I can't wait to wear all of these! They are really, really beautiful in person. I've already worn Drunk Dial on my toes (loved it! ), and have worn and swatched The Whale- so look out for that one soon! Have you guys tried SUPER BLACK yet? Do you have a favorite polish? All of those bottles lined up next to eachother look like they'd make a fantastic galaxy manicure together! The Whale is one of my most favorite polishes ever. YOU'RE RIGHT! How did I not see that?! :D I'm not always into glitter mixes....but there's something about these, you're right! Eye candy! Awesome nail mail! Those colors look gorgeous! Love the close up bottle shots. Hambone is being extra-adorable and handsome in this post! I love the look of these polishes, and especially the bottles - looking forward to swatchy swatches.